Summertime the way it used to be. Remember the stress free days of being a kid in summertime? When your biggest concern was how many crayfish or frogs you collected in the creek with your friends? Today is different. Our children are so busy with scheduled sports and activities–and sometimes, we parents find ourselves craving the simplicity of yesteryear for our children: Long summer days filled with friendships & fresh air, swimming & sports, music & drama, arts & crafts. Here, the true magic of childhood unfolds. 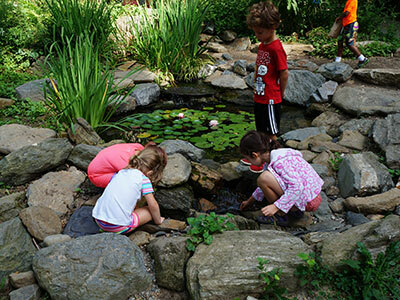 At Miquon Day Camp, children experience summer the way it used to be–when kids had freedom to play, wonder, and experience the joys of the great outdoors. Located in a 10-acre wooded valley just outside Northwest Philadelphia in Whitemarsh Township, we offer a rustic setting in which your children can have that summer camp experience of yesteryear. Miquon is close enough to be accessible to many neighborhoods in and around Philadelphia while feeling far from home and in the wilderness while you are there. The campus setting provides a sense of beauty and calm to an energetic and busy day. Campers spend most of their day outside doing activities; each “bunk” is a kid-sized building of their own that provides a home base and rainy day retreat.